THEY TOLD ME not to go. I left behind the worry-free environment of our first school in the jungles of southeastern Honduras. Now, after traveling five hours to the closest city of Danli, I was planning to travel again to another jungle: one filled with chaos and crime. An additional two hours would bring me to the capital city of Tegucigalpa (Tei-goo-si-gal-puh). Tegucigalpa is considered one of the most dangerous cities in the world, compounded by a media that continually publishes vivid photos of the daily tragedies. Yet, knowing the lack of skateboard opportunities in the area, this is where I arranged for Bridge To Skate to hold it’s very first skateboard contest in Honduras. Although I’m a primary target for robbery – and the bus was robbed the day before – I was determined to go. It was pouring down rain outside, which only fed into the doubt of my critics and heightened the tension while entering the bus. The “chicken bus” that I was traveling on was full of oversized luggage and devoted Christians praying for our safety at every stop. But, after a couple of hours of nerve-wrecking traveling, we made it to Tegucigalpa. I grabbed a taxi and swerved along the winding brick roads to my final destination: Parque La Leona. Upon arrival, I couldn’t stop smiling: “they came,” I said to myself. “They came even though it’s raining outside”. I was in absolute awe. In a country where there’s no skateboard shops and no skateboard parks, there were nothing but skateboarders. Everywhere. What occurred on that rain day in a city I “shouldn’t travel to” was magical. There were 72 skateboarders that competed in the contest and even more cheering on their friends or skating the ramps we rented that day. There are no words to describe the passion I felt. The cohesion and support these skaters lend to each other is like nothing I’ve ever seen. In Tegucigalpa, people aren’t skateboarding to get sponsored or make money; they’re skateboarding for fun. They’re sharing boards and taking off their shirts and drying pavement when necessary. I will forever be indebted to this area after that day. It almost brings tears of happiness to my eyes when I think about how lucky I am to have experienced such a raw form of something so meaningful. The kids that came out on that rainy day are now my family. 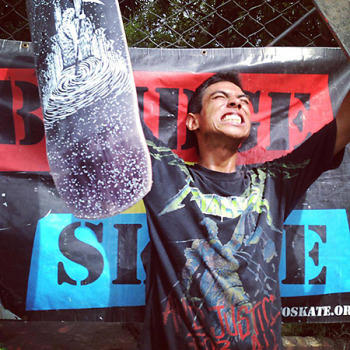 And, our skateboard programs in Tegucigalpa are now flourishing. I couldn’t be more pleased.